Another likely case of the H1N1 virus has been discovered in Iowa. Governor Chet Culver announced this morning that the state is still waiting for confirmation from the Centers for Disease Control regarding the first two probable cases of the flu strain that were found in Clinton and Des Moines Counties. "In addition to the two suspected cases, the Department of Public Health has identified a third probable case in Marshall County," Culver said. State epidemiologist Dr. Patricia Quinlisk identified the individual in Marshall County as an adult male who recently traveled to an area of the U.S. where there are several confirmed cases of H1N1. Quinlisk says the individuals in Des Moines and Clinton Counties have recovered and are returning to the daily routines, while the individual in Marshall County is still sick and is isolated at his home. Around 90% of the suspected H1N1 samples sent to the CDC from around the U.S. have tested positive for the virus. Iowa Department of Public Health Director Tom Newton says hundreds of thousands of doses of antiviral medications are being delivered to health facilities around the state. He praised health care workers in eastern Iowa for the their quick response, when it was learned one of the potentially infected individuals had visited a nursing home. Newton says around 50 residents of the facility were given antiviral medications. "We’re convinced at this point that any public health risk associated with (the nursing home) has been mitigated," Newton said. "Distribution and administration of antivirals has minimized any risk to the individuals in that facility." He declined to identify the name or exact location of the nursing home. 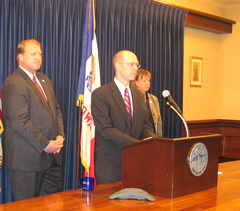 Governor Culver says the Iowa Department of Public Safety is also part of Iowa’s response to H1N1 influenza. He says officers are providing "around-the-clock watch" of the state supply of antivirals and state troopers are providing security during the delivery of that medicine across the state. Culver says other states, that have multiple confirmed cases of H1N1, have employed their National Guard to ship and protect the drugs. The governor plans to issue a Public Health Disaster Declaration if a confirmed case surfaces in Iowa. Quinlisk describes all of the measures being taken in the state as "precautionary" and says the public should be on alert, but there’s no reason for panic. "I think the concern right now is not so much (about) the disease we are seeing right now, but the potential for what might happen in the future," Quinlisk said. "As we’ve seen from other parts of the world, the potential might be pretty easy for it to be spread…we might see more cases. So, if we can take all these precautions now, while it’s mild, we may be able to mitigate how bad this could be."